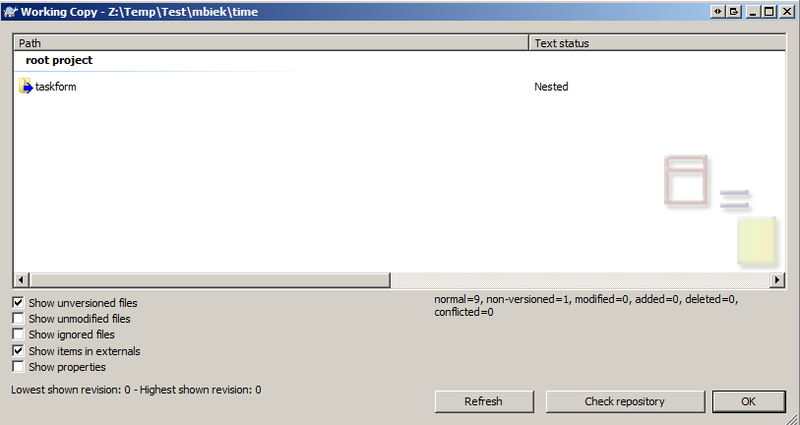 Mark Biek : SVN working copy is nested? SVN working copy is nested? Have you ever gone to commit something and TortoiseSVN tells you that part of your working copy is “nested"? It means that the nested folder contains the Subversion meta-information for a different working copy! I find this usually happens when you copy a directory into your working copy from somewhere else and forget to delete all of the .svn directories. The interesting thing is that, despite this warning, Subversion will happily commit any changes you’ve made in that directory. The problem is that it commits them to whatever repository that directory came from, not to your repository. We had a situation at work today where part of a working copy was nested and we thought we’d lost the only copy of a modified image as a result. Luckily we were able to pull the correct image from the revision log of the other working copy. So how do you fix a nested working copy? It’s really easy. \1. Delete all of the .svn directories from the nested directory. \2. Add the directory into subversion (svn add). \3. Commit the add (svn ci).